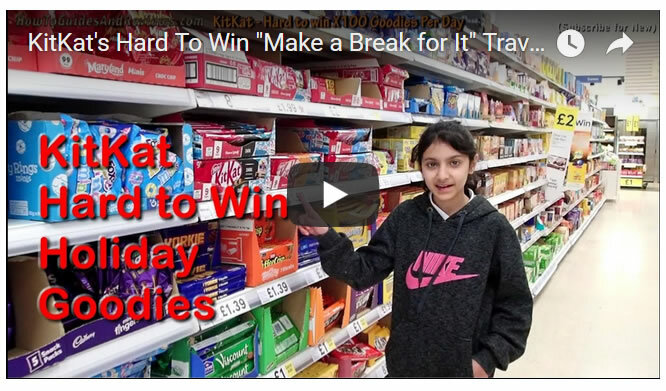 KitKat's "Make a Break for It" 2019 Travel Goodies Promo, Has Anyone Won Anything? KitKat's 2019 promotion that went live online on the 1st of Feb, promoting 10 top prizes of holidays worth £8,000 each to be instantly won by finding a golden ticket inside a Kitkat packet has just 10 days left to run. Also there were supposedly 100 getaway goodies to be won EVERY DAY just by entering the codes found on the inside of Kitkat wrappers which means this 'should' have been an easy to win promotion. this promotion is just proving near impossible to win anything! For instance our experience for the duration of the promotion, after having entered over 40 codes is to win diddly squat! So has anyone won anything? After all there are supposed to be 100 prizes per DAY! This is the problem with these types of promotions by KitKat and other promoters such as Walkers in that they are not always delivered in a competent manner. So instead of winning say a dozen bottom end prizes by now, as one would typically expect given the 100 prizes are per day publicity. So once the promotion is over it will be interesting to see whether the promotion actually delivered 100 prizes a day or not.